Two internal 30-mm DEFA cannons; Up to 4,630lb of ordnance on six hardpoints. Weaponry includes rocket pods, LGB's, Magic AAMs, up to two Exocets, ASMP nuclear missile. The Etendard was the first naval aircraft developed by Dassault. * A Thomson-CSF Agave I radar in the nose. The Agave was a multimode radar, with navigation and air combat capabilities, but optimized for maritime strike. It was fitted in a relatively prominent, slightly drooping nose radome that provided an instant recognition feature relative to the Etendard IVM. * A SAGEM-Kearfott ETNA navigation-attack system, which integrated an inertial reference system, a Thomson-CSF head-up display (HUD), a navigation display, an armament control system, a radio altimeter, and a TACAN beacon navigation system. (Antennas for the comparable civilian VOR beacon navigation system were also fitted to each side of the tailfin.) ETNA would be aligned before takeoff from a carrier and was accurate to within 2.2 kilometers (1.4 miles) per flight-hour -- enough to get the aircraft within range of TACAN at the end of a mission. * A Thomson-CSF BF RWR, with the antennas in the tailfin as per the Etendard IVPM. The Etendard IVM was beginning to appear behind the times in the late 1960s, and so the Aeronavale started to cast around for a replacement. There were a number of good candidates, a prominent one being the US Vought A-7 strike fighter; the Aeronavale was an enthusiastic operator of the A-7's cousin, the Vought F-8 Crusader, and the admirals had no strong reason to turn up their noses at the A-7 simply because it was made in the USA. They also had a partly French-built candidate, a navalized version of the Anglo-French SEPECAT Jaguar, the "Jaguar M". However, although Vought and SEPECAT had excellent products, and some sources claim that the Aeronavale was leaning towards the A-7, it seems that Dassault had superb salesmen who gave a pitch that was unarguably hard to turn down on the face of it: why not just update the Etendard IVM? The improved version would be "90% compatible", making it a cheap solution, and it would be an all-French product as well. What wasn't to like? 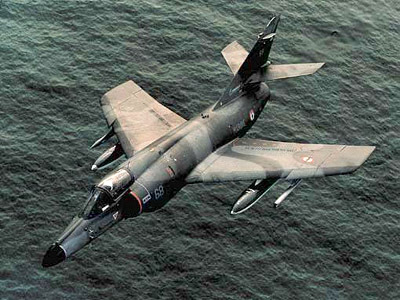 The "Super Etendard", as it was known, won the competition in January 1973. Three Etendard IVMs were used as developmental aircraft in the program, with the first true prototype performing its initial flight on 3 October 1975. The first production machine performed its initial flight on 24 November 1977, with the first deliveries of what would turn out to be a total of 71 Super Etendards to the Aeronavale the next year. One of the major changes in the Super Etendard, or "SuE" as it was called, was fit of the improved SNECMA Atar 8K50 non-afterburning turbojet, with a maximum thrust of 49.0 kN (5,000 kgp / 11,025 lbf). It was also supposed to have better specific fuel consumption, but it seems it was little or no improvement in that regard. Internal fuel capacity was increased to 3,270 liters (845 US gallons) in some compensation. The Atar 8K50 was derived from the 9K50 turbojet used on the Dassault Mirage F1, with corrosion protection added and the afterburner removed. It had a fixed exhaust nozzle, unlike the "eyelid" nozzle of the Atar 08B fitted to the Etendard IVM. Bigger engine intakes were fitted to the SuE to provide adequate airflow to the uprated engine. Outside of these changes, the Super Etendard was very much like the Etendard IVM, with four underwing pylons and a centerline pylon; twin DEFA cannon; a retractable inflight refueling probe on top of the nose; and so on. In fact, if it weren't for the different nose, it would be difficult to tell the Etendard IVM and Super Etendard apart. However, the notion that the Super Etendard was going to be "90% compatible" with the Etendard IVM was replaced by the reality that the two were more like "90% different", and the supposed cost benefits didn't materialize. The Aeronavale had wanted 100 Super Etendards but cost escalation reduced the quantity to the 71 mentioned above. For the same money, the Aeronavale could have obtained more aircraft with greater warload capability and radius of action. That said, the Super Etendard was effectively state-of-the-art in terms of its technical sophistication, in particular providing a platform for carriage and launch of the Aerospatiale AM39 Exocet solid-fuel antiship missile, with the Agave radar providing targeting. The usual flight configuration for the antiship attack mission was an Exocet on the inner pylon of one wing and an external tank under the inner pylon of the other, with AAMs or defensive aids optionally carried on the outer pylons. The empty external tank was dropped before missile launch to maintain trim. In the early 1980s, most of the Super Etendard fleet was updated to support the nuclear strike mission, with the flight configuration much like that used for the Exocet -- a nuclear store on one inner pylon, an external tank on the other, and optionally AAMs (usually the Matra Magic) or defensive aids on the outer pylons. Nuclear stores included the AN52 tactical nuclear free-fall bomb, with a yield of about 15 kilotonnes; or the ramjet-powered "Air-Sol Moyenne Portee (ASMP)" missile, with a yield of over 100 kilotonnes, a speed in the range of Mach 2 to Mach 3 depending on altitude, and a standoff range of about 100 kilometers (60 miles). Carriage of the Exocet or ASMP required removal of the 30 millimeter cannon to make room for "black boxes". Of course, conventional stores like those carried by the Etendard IVM could also be employed, such as dumb bombs and unguided rocket pods, with a munition on each outer pylon and an external tank on each inner pylon. A bigger external tank, with a capacity of 1,100 liters (290 US gallons), was introduced for the Super Etendard, taking advantage of the SuE's greater carriage capacity. However, a pair of the big tanks was too heavy if a full combat load was also being carried, and in that case the old 625 liter tanks were fitted instead. Since an Exocet strike configuration included only one tank, the 1,100 liter tank was usually carried for that mission. The Super Etendard could also carry the old 600 liter centerline tank, though again it is unusual to find pictures with it fitted. Of course the old Douglas tanker pod could be carried as well. Maximum external load with full internal fuel was 2,100 kilograms (4,360 pounds). Initially colors were the same as for the earlier Aeronavale Etendards -- dark gray-blue on top, white on bottom -- but were later changed to the overall two-tone gray-blue disruptive pattern also given to the Etendard IVP/PM.